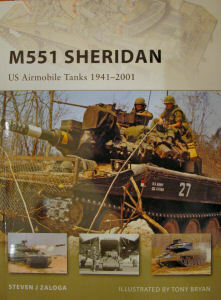 Noted armor expert and author Steven Zaloga has published this new monograph on the US Army's Airborne Tank, the M551 Sheridan. The quest for an effective tank that can be delivered by parachute came in earnest starting in World War Two as airborne troops lacked the ability to defend against armored opposition. Two approaches to a tank tailored for deployment with airborne forces started during WW2, with the first prototypes culminating into the Locust and T-92. The one and only US tank that ever went into production that could be delivered by parachute and conduct anti-armor operations in support of airborne troops was the M551. The aluminum-hulled tank wouldn't stand up to a standard gun fight against another tank, so the Sheridan employed the Shellelagh missile to strike opposing armor from a safe distance. While the M551 saw combat in Vietnam, Panama, and Desert Storm, its Shellelagh missile was only fired in anger against an Iraqi tank during Desert Storm. The author describes the development of the requirements for this tank from operational need and early experiments which would finally result in the Sheridan. This monograph describes the development, deployment, and operations of this unique tank in combat and as a training asset. Coverage wraps up with a number of conceptual follow-ons which may one day result in an effective replacement to this tank. This book is a must-have for the historian and armor modeler to clearly understand the development and details of this unique battle tank.